The relationship between Mason Bates and the San Francisco Symphony has played a pivotal role in the emergence of one of the most frequently performed American composers at work today. It began in 2009 with the first SFS commission of an orchestral work by Bates, The B-Sides: Five Pieces for Orchestra and Electronica (dedicated to Michael Tilson Thomas), and has continued through this most recent collaboration, which receives its world premiere on this program. Celebrate American music! 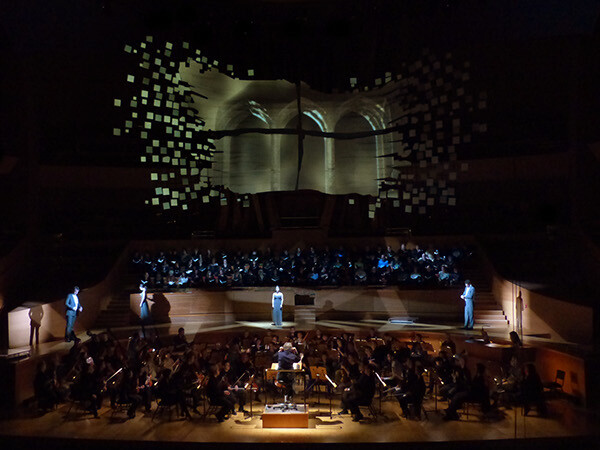 And you can’t do much better than Tilson Thomas and the San Francisco Symphony for this rep. I did what I wanted to, quite sure that the thing would never be played, although the uneven measures that look so complicated in the score are mostly caused by missing a beat, which was often done in parades. In the parts taking off explosions, I worked out combinations of tones and rhythms very carefully by kind of prescriptions, in the way a chemical compound which makes explosions would be made. This week brings the San Francisco Symphony’s performances with Michael Tilson Thomas of the Missa Solemnis of Beethoven — a work that certainly belongs to my top-ten list of all time. Following a trial run in Los Angeles in January, it’s being given as a “multimedia staged event”, complete with scenic, lighting, and video design; James Darrah is the director. In the grandest sense, this “Missa Solemnis,” with all its attendant baggage, is a kind of mission statement for MTT. He sets out to unpack a complicated artistic and musical construct, to reveal its workings and to treat it as a large-scale act of discovery. The Missa Solemnis held intense personal significance for its composer as well: “Von Herzen — Möge es wieder — Zu Herzen gehn!” (“From the heart –- may it return to the heart!” wrote Beethoven on the copy of the score he presented to its dedicatee, his pupil and friend Archduke Rudolf. Next week MTT and the SFS continue their Beethoven Festival with a recreation of an earlier “marathon concert”: the one on a cold December night in 1808, when Beethoven premiered his Fifth and Sixth Symphonies, and Fourth Piano Concerto in a program that also included a concert aria, three movements from his other Mass setting (the Mass in C major), a piano fantasy, and the Choral Fantasy, that fascinating precursor to the Ninth.